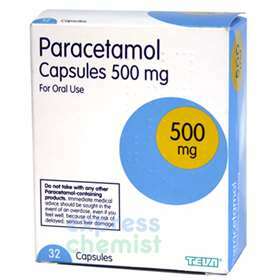 Paracetamol Capsules 500mg - Each tablet contains 500mg Paracetamol - For mild to moderate pain. A painkiller for the relief of of mild to moderate pain, including migraine, headache, toothache and period pain. Adults and children over 12 years - 1-2 capsules every 4 hours to a maximum of 8 tablets in 24 hours. Do not give to children under 12 years unless advised by your doctor. Do not exceed the stated dose. PARACETAMOL, POTATO STARCH, SODIUM LAURYL SULPHATE, MAGNESIUM STEARATE, GELATINE, ERYTHOSINE, PATENT BLUE, TITANIUM DIOXIDE AND QUINOLINE YELLOW.